Most medical imaging essentially offers two points of view: Very big (CT, MRI, PET) and really tiny (microscopy). 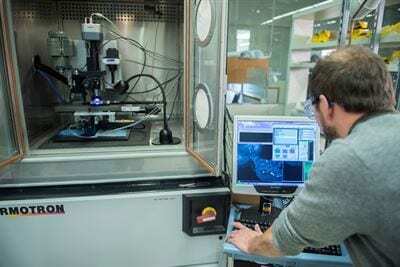 =Medical Physics graduate student Jeremy Bredfeldt views an image produced by the Sequential Erosive Tissue Imaging device, developed by a team at the Morgridge Institute Advanced Fabrication Laboratory. Called “Sequential Erosive Tissue Imaging,” or SETI, the device builds three-dimensional digital replicas of tissue samples such as tumors. The images are created through a milling process that removes hundreds of micron-thin tissue layers, takes high-resolution images of each new surface, and then digitally reassembles a whole-tumor structure. Ben Cox and Jeremy Bredfeldt, medical physics PhD students leading the project, built SETI to provide a crucial look at the intercellular makeup of tumors, which rarely are uniform in how they develop and spread. The value of SETI is expanding both the volume and depth of visual information available on diseased tissue. SETI could be a useful tool in determining whether drugs are hitting their targets across entire tumor samples, as opposed to microscopic snapshots. Medical devices team leader Thomas “Rock” Mackie likens it to a “Google Earth” for microscopy, providing a glimpse of biology analogous to landscapes and terrains. Kevin Eliceiri, medical devices affiliate investigator and LOCI director, says that SETI marries the benefits of high-resolution fluorescence imaging with physical sectioning techniques. That allows the 3D structure to be precisely mapped in relation to functional readout via fluorescently labeled proteins. SETI can do this with a unique combination of speed, depth and accessibility, he says. UW-Madison comparative biosciences professor and prostate disease expert Chad Vezina is currently conducting pre-clinical work on prostate cancer using the SETI technology. When studying cancer in animal models, Vezina uses SETI to achieve high-volume imaging of cells in order to understand the intercellular interactions of the disease — a key to how the cancer spreads. Vezina is working with LOCI and Morgridge investigators, including LOCI undergraduate Jessica Zeman, on specimen preparation techniques that would allow for deep high-resolution imaging of prostate samples. The top markets for SETI, which has a patent pending by the Wisconsin Alumni Research Foundation (WARF), include biomedical research, drug development, and biomarker and tracer development. Since SETI is a form of “destructive imaging,” the device is limited to pre-clinical research work meant to better understand disease and treatment modalities. As the capacity to harness Big Data for human health applications increases, an automated imaging technology like SETI can effectively capture and feed tremendous amounts of previously unavailable biological data into large-scale data analysis systems.